Enforcement Directorate (ED) has issued summons against Dayanidhi and Kalanithi Maran and all others accused in Aircel Maxis money laundering probe case. The agency, sources said, has issued the notices under the Prevention of Money Laundering Act (PMLA) and they have summoned the accused to examine them and record their statements. The agency is expected to issue an attachment order for seizing of assets of an estimated value of over Rs 600 crore or Rs 6 billion in this case before which this questioning is necessary, they said. "All the accused in this case, as taking per the CBI case registered against them, have been summoned by ED," sources said. The ED is expected to issue attachment orders within few weeks time, they added. Besides the Maran brothers, CBI has named Malaysian business tycoon T Ananda Krishnan, Malaysian national Augustus Ralph Marshall and four firms -- Sun Direct TV Pvt Ltd, Maxis Communication Berhad, Astro All Asia Network PLC and South Asia Entertainment Holding Ltd -- as accused. The CBI has charge sheeted them for the offences punishable under section 120-B (criminal conspiracy) of the IPC and under relevant provisions of the Prevention of Corruption Act. CBI had alleged in the court that Dayanidhi had "pressured" and "forced"
Chennai-based telecom promoter C Sivasankaran to sell his stakes in Aircel and two subsidiary firms to Malaysian firm Maxis Group in 2006. The ED's money laundering case is based on this. 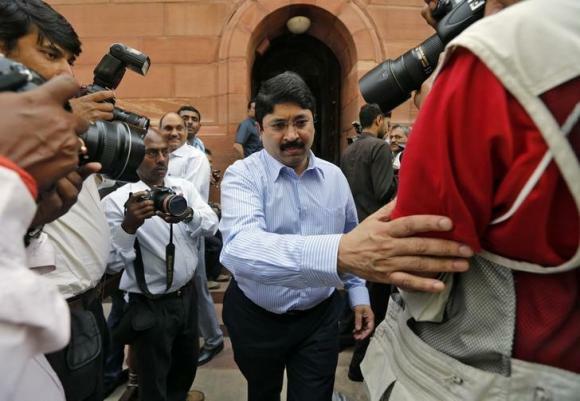 Image: Dayanidhi Maran (C), a leader of Dravida Munnetra Kazhagam (DMK) party, walks after attending the parliament session in New Delhi.